The Nelson suite is air-conditioned, includes free, fast unlimited internet and can be configured exactly as you like for parties of up 40 people. This room is ideal for presentations, training seminars and meetings and offers a memorable setting for any event. Our experienced and professional team will take care of every detail, as you would expect from one of the best London conference venues. Our beautiful suite of meeting and event rooms will make a big impression on your delegates, and the state-of-the art audio visual equipment and fast, free, unlimited Wi-Fi will ensure that your meeting exceeds expectations. Hold your meeting or event at Amba Charing Cross and rest assured that every little detail will be taken care of. 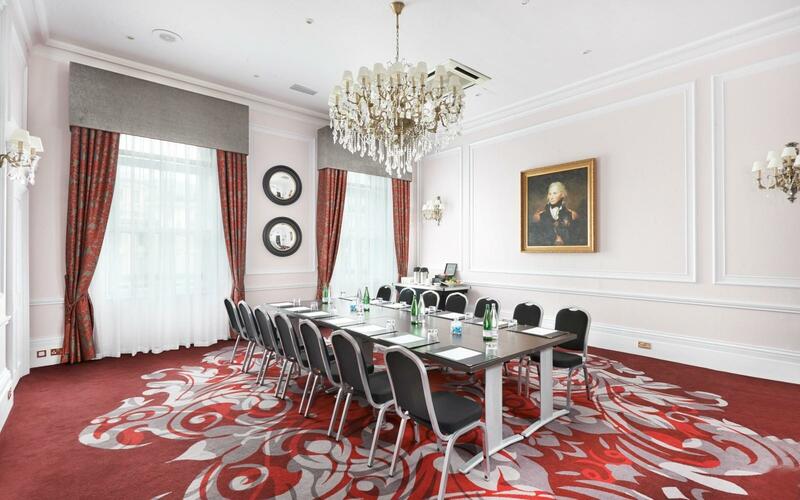 Like all nine of our meeting rooms, with its original Victorian ceiling soaring 15 feet above you. Dedicated Event Manager from the moment you enquire, through to the moment your event is all wrapped up. AV experts to help set up, give access to the latest technology and provide last minute support. We’ll make you look good and keep your guests delighted. A meeting to remember before, during and after.